HubSpot defines Inbound Marketing as “a methodology that focuses on creating quality content that pulls people toward your company and product”. By aligning the content you publish with your customer’s interests, you naturally attract inbound traffic that you can then convert, close, and delight over time”. Having great content to distribute is obviously crucial. Creating that content for Inbound marketing isn’t easy – but shouldn’t be impossible either. So why is it that so many vendors selling to capital markets firms struggle with inbound marketing? In Banking, Capital Markets and Asset Management there are complex industry concepts, arcane terminology, and the market landscape is particularly fluid right now resulting in very specific customer pain points and opportunities. On top of this, vendors serving the sector must engage some of the most sophisticated buyers and users on the planet. Furthermore to be successful, companies must create a regular flow of high quality explanatory and ‘how to’ types of information and materials so they can continuously publish new content to attract the attention of potential buyers. And then nurture those leads with a different set of content (e.g. case studies, demo’s and trials) as your prospects move from awareness to evaluation and decision. As you might expect a lot has been written about this topic – in particular by the marketing automation vendors whose platforms become more compelling the more content you have to manage. I’ve read quite a lot of their advice and on the whole it’s very helpful; a good example is Marketo’s “The Definitive Guide to Engaging Content Marketing”. Most talk about the requirement to re-align the Marketing team around inbound marketing, hiring a Head of Content, building a content plan and so on. I fully agree. Where we part company is when it comes to actually creating content. It is naïve to expect that hiring writers or getting the subject matter expert in a room for 30 minutes to jot down their thoughts is going to cut it. What’s needed when targeting capital markets firms with Inbound campaigns is a structured and repeatable process to create an ongoing pipeline of great content. Now that’s hard to do but well worth the effort. 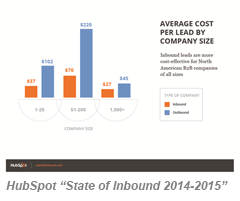 (See Survey results from HubSpot). What’s your ‘Inbound Content Score’? Check out the Checklist and see how you rate.